In New England there are numerous single and multi-family homes that were built at the turn of the 20th century or earlier. At the time of construction these homes typically used some form of metal piping for the drain lines. Copper, galvanized steel and cast iron piping are among the most common. The larger diameter drain lines, from 3” and up, are typically painted black at the factory and are made from cast iron. For over a hundred years plumbers have used cast iron piping for waste lines in residential and commercial plumbing applications. Much of this older piping is reaching the end of its average lifespan. When performing a home inspection in a home that is 50 years or older, I try to pay special attention to the cast iron waste lines that are accessible and visible. While cast iron piping typically lasts somewhere between 80 and 100 years, it can begin to fail in as little as 50 or 60 years if it was lower quality or there were manufacturing defects. 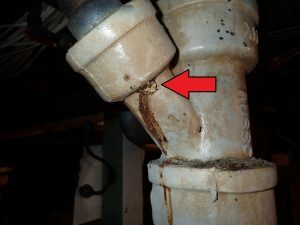 One of the common ways that cast iron piping exhibits early signs of failure is through pinhole corrosion. These small globs of rust are locations on the pipe that have gotten thin and have either cracked or perforated. Tiny droplets of sewage may seep through, but then rust will fill the hole and temporarily close it off. As the corrosion continues, the hole expands and so does the rusty mass. This can occur anywhere on the pipe, but it is very common to find it on the large fittings at the main plumbing stack. 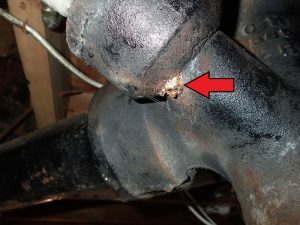 You should never attempt to scrape or remove this rusty glob from the pipe. You might be left with a small hole and possibly create an active leak in the process. Always look at the area immediately below. You will probably see some small splatters on the basement floor or on household objects or boxes that have been sitting under the piping for a long time. If so, that’s contaminated waste water. This condition may not have the same urgency as a ruptured water heater or a backed up toilet, but you should monitor these areas very closely and plan on calling in a licensed plumber for help. Depending on the individual, your plumber may replace the damaged fitting with another hub and spigot, a no-hub connection or even change out the affected piping with PVC.